The new fleet, featuring BMW 520i Touring cars, is being rolled out progressively from now until the end of the year, as the previous fleet of cars is retired. This fleet upgrade is part of Emirates’ ongoing investment in product and service both on the ground and on board. 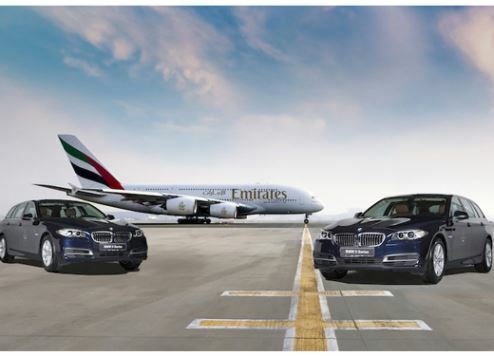 Emirates’ chauffeur-drive service is a complimentary ground transfer service available to customers travelling in First or Business class, whisking customers to and from the airport for a seamless travel experience. The service is available in more than 75 Emirates destinations worldwide. The service complements Emirates’ worldwide lounge offering with seven located in Dubai International Airport’s concourses A, B and C, and 34 dedicated Emirates Lounges in other major airports across the globe. The airline recently introduced “pay-per-visit” lounge access, enabling Emirates Skywards members and their guests travelling on Emirates to enjoy the airline’s First and Business Class lounges at Dubai International Airport and abroad. To complete the Emirates premium travel experience, new features have also been introduced on board. They include the world’s first ‘moisturising lounge wear’ in First Class, luxury blankets, skincare from organic brand VOYA and a new range of amenity kits from Bulgari. Emirates Skywards are a strategic partner of The First Group, a collaboration that allows the property development firm to award Emirates Skywards Gold membership to a select group of high-value investors, giving them access to a range of privileges. Benefits include Business Class lounge access for members and a guest throughout the Emirates network, additional 16kg baggage allowance, a guaranteed seat on all Emirates flights, priority baggage delivery, 50 percent bonus Skywards Miles on all flights and more. Skywards Miles can be earned and redeemed with Emirates and their global airline, hotel and lifestyle partners.